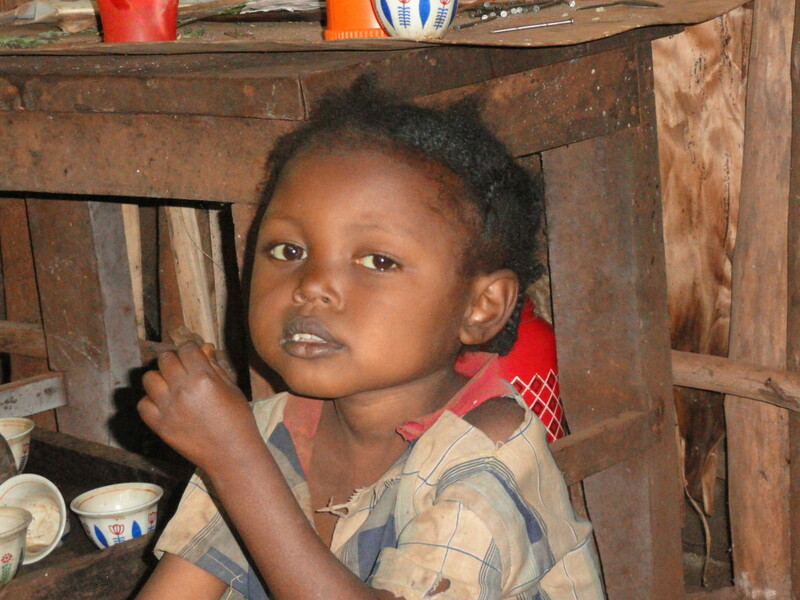 Selamawit is a little 5 year old from Ethiopia who is suffering right now from the dangerous effects of malnutrition. The unfolding food crisis there is threatening the well-being of millions of children just like her. Selamawit is already suffering from Kwashiorkor, a malnutrition disorder. Selamawit (5) is the little sister of Temesgen (7). We recently highlighted the plight of their family (Click Here) as they struggle to survive and stay healthy, while available food supplies get scarcer and scarcer. Selamawit & Temesgen are surviving on little more than coffee and a few roasted chick peas each day. Its not enough to keep a child healthy…not nearly enough. As bad as it is now, with no end in sight to the drought that has caused the crisis, things are liable to get much, much worse. This is a desperately worrying situation for these kids and for millions of others like them in Ethiopa. If we sit back and do nothing, a disaster may unfold before our eyes. ChildFund International’s Content Manager Christine Ennulat has written some words from the heart (below) to try and sum up her feelings about Selamawit, and the dangerous predicament that she, her family, and millions of families in Ethiopia now find themselves in. Happy World Food Day! There are starving children in Africa. At how many dinner tables in how many homes have finicky children been scolded that way to get them to eat their dinners? And how many children have rolled their eyes at their admonishing parents? How many of those parents really were speaking from a place of gut knowledge about what it means for a child to starve? Clichés come to be clichés because they’re true. There are, and ever have been, starving children in Asia and in Africa. They are also in South America and in North America — right here in our back yard. All over the world. A truth devolves into a cliché through overuse. We become numb to the idea. The whole world has become numb to the idea of starving children. That’s why fundraising for a slow-onset crisis like a drought is so challenging, much more so than for a splashy, sudden typhoon or a devastating earthquake. Selamawit became so malnourished that her condition tipped into kwashiorkor, or protein-energy malnutrition, which causes loss of muscle mass, irritation, fatigue, skin issues, diarrhoea, liver damage, failure to grow and more. Kwashiorkor is behind the round bellies we see in the now-clichéd photos of starving children in developing countries; the lack of protein causes fluid to collect in the abdomen and elsewhere. And time will tell for Ethiopia, but we know what to expect for the coming months: The drought that has decimated the harvest nationwide is expected to continue well into 2016, thanks to what some are calling the strongest El Niño event on record. In a country where 86 percent of the population depends on subsistence farming, the failed harvest means that families must instead purchase all their food, and prices are rising. Poorer families can’t afford the food they need, so they reduce their intake dangerously. It happens slowly and quietly. And it silences children. And you can take the opportunity of this World Food Day to tell your friends and networks what’s happening in Ethiopia. Tell them about Selamawit, and about her brother, 7-year-old Temesgen. Every day after that, keep an eye on the crisis, and encourage those around you to do so, too. You’ll have to look for it in the media, because it’s not a typhoon or an earthquake. We’ll keep you posted on our website and social media channels.